We rounded the corner, past grey eminences of tower blocks, and emerged onto a curving road with cars parked on both sides. Soon we reached a rust-brown staggered metal fence, beyond which a low mound was evident, with low boulders situated on top of it. This was to be the focus of our investigation on this cold clear afternoon. Physical access to the stones was blocked by the aforementioned fence, and so we journeyed further to the north, looking for an easier way into this strip of waste ground. Looking back towards the boulder-mound, we noted that jutting above the roof horizon was a red tower. We were later to discover through enquiries that this was the water tower of an old hospital that once housed patients with infectious diseases. 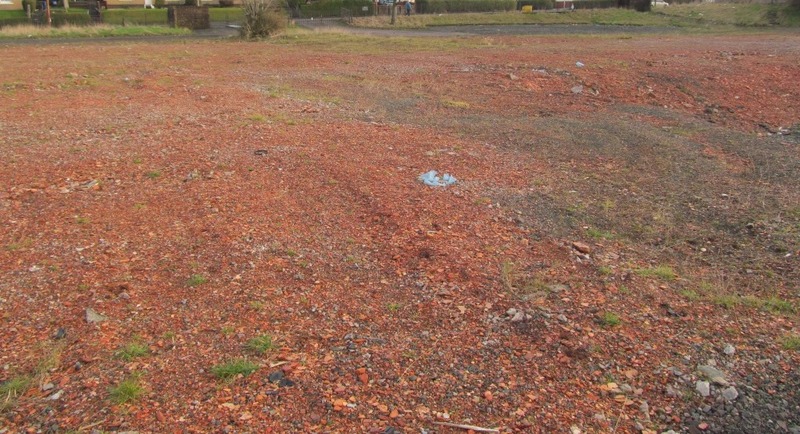 Soon enough, the gates were scaled, and we dropped down into the grounds of what was once a place of learning, a primary school, now nothing more than an irregularly shaped, flat patch of red rubble, littered with broken plastic pipes, glass bottles and brick fragments. A vandalised sign hanging from the fence warned against tipping, but clearly tipping had occurred. A single tree sat amidst the debris of this flattened school, pipes jutting out from amidst its roots, indicating where the fluids of the school came and went. 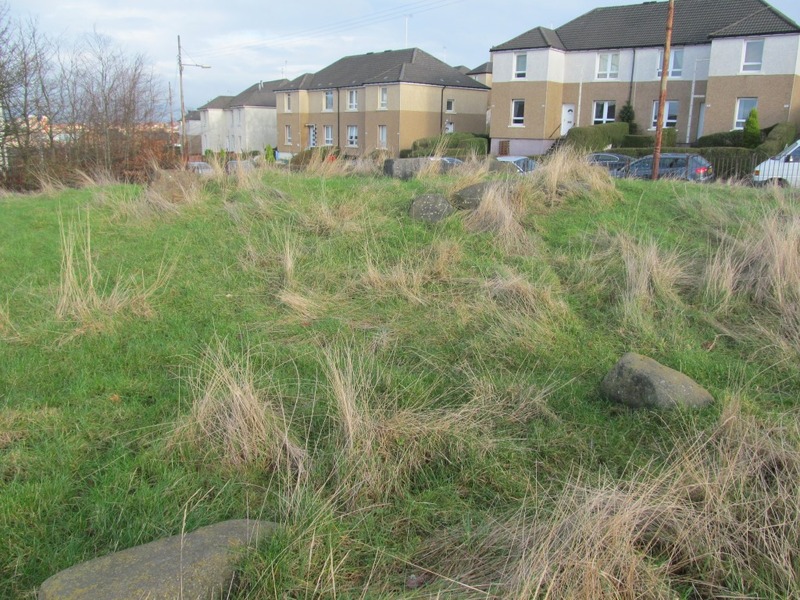 To the north of the school, in what we presumed to have been the playground, was located the mound already mentioned. A pathway of tarmac, and then worn grass, led us to the mound, and we walked towards it with a sense of intrigue. In front of us was a setting of low and squat standing stones. This monument (for we could not think of a better word for it) consisted of a roughly circular setting of large, coarse boulders, being in total in the order of 5 or 6m in diameter. The circle was open on the west-south-west side and during our visit this roughly aligned towards the watery sun. 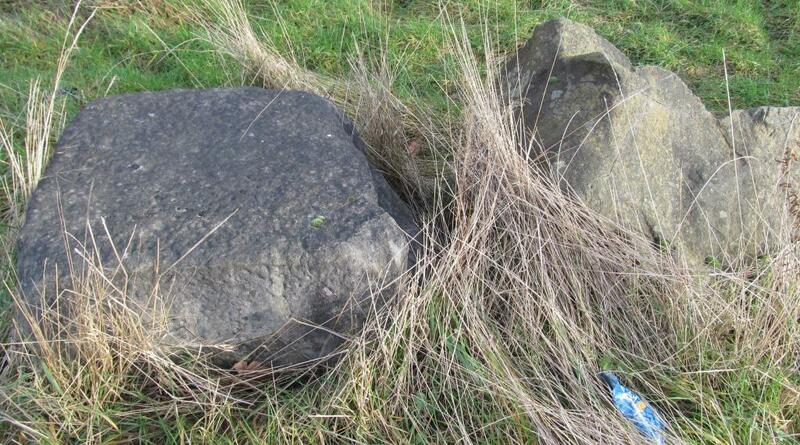 We managed to count in the order of 12 stones forming the irregular boundary of this setting. Two stones of a similar character just to the south-west may have been outliers, or perhaps had been removed from the circuit of the monument, or become dislodged and rolled down the slope. Within the centre of the stone setting was a very large block of a different lithology to the rounded boulders that formed the perimeter of the megalith. 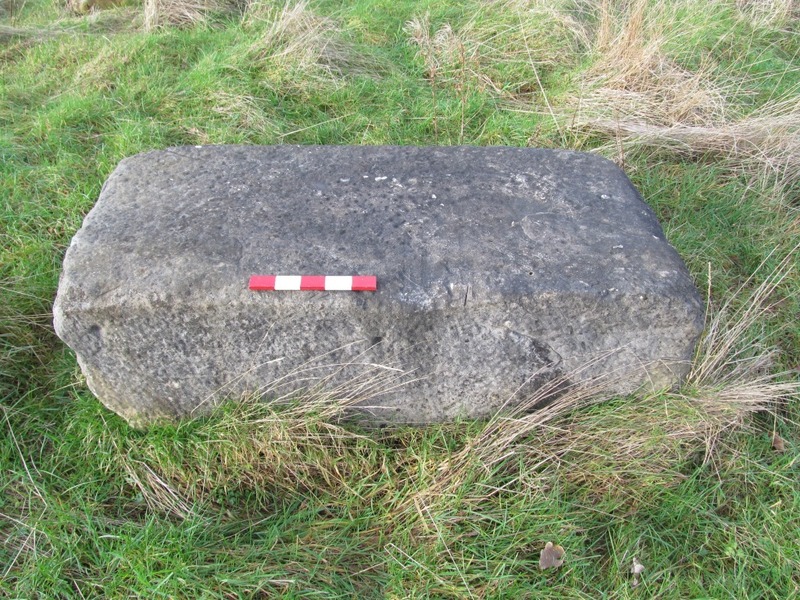 This large monolith was about 1.3m in length, and was of an angular shape, that led us to believe that this stone had previously been part of a large building or wall. The stone had a line of holes on one face, and was dressed on several sides. We identified a second, similar but smaller, angular block on the western side of the monument. We have no way of telling if this central stone was once erect, but it had the bearing of a standing stone that had once stood. 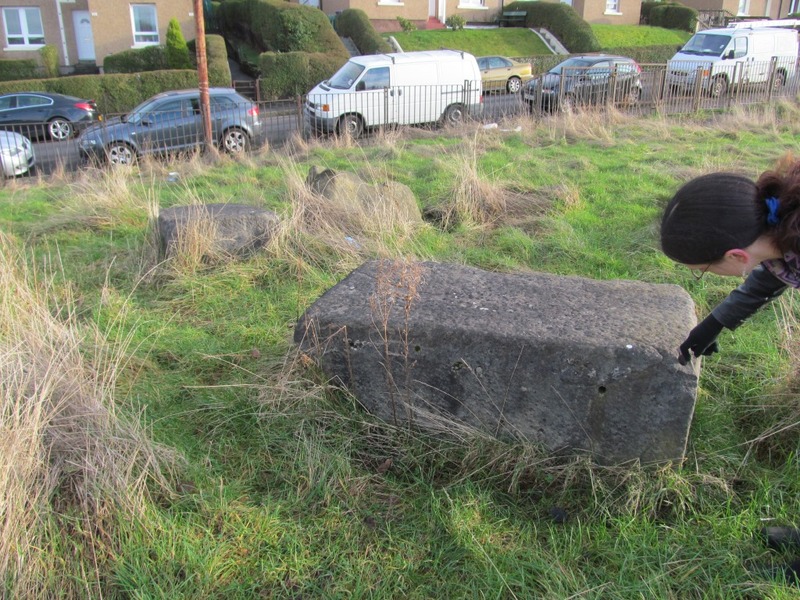 Our careful investigation of the monument and surrounding area provided no clues as to the age or function of this monument. 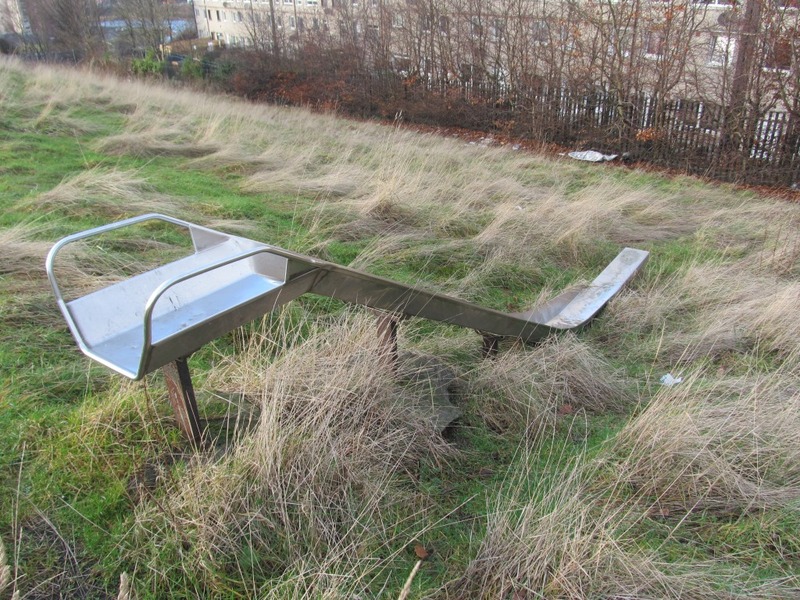 A short distance to the northwest we discovered a playground slide, set into the ground in concrete, running down a slope into an unappealing gully. Although rusty and pockmarked, the shine on the silvery surface of the slide suggested it had been in recent use. 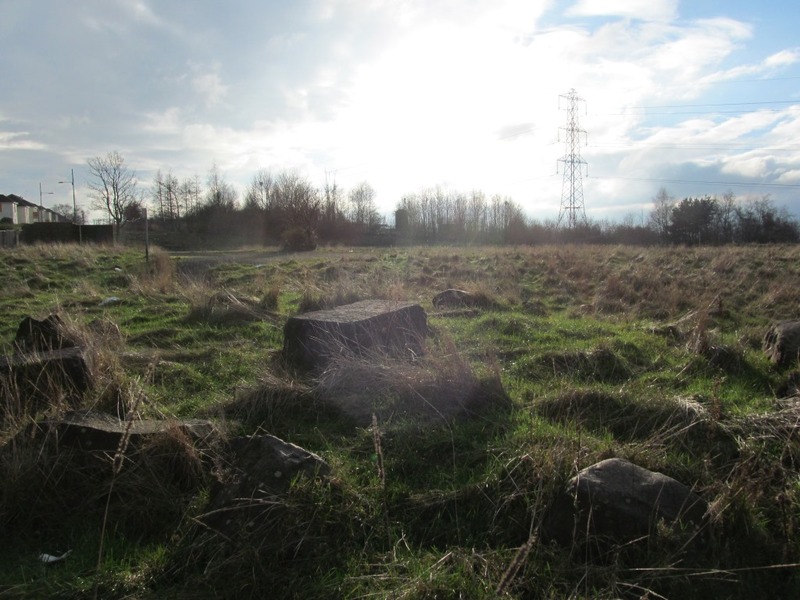 We speculated on the use of this stone circle, this circle of stones. Was it constructed after the school had been abandoned or demolished, some kind of memorial perhaps? Did the dressed blocks come from the school? Or was the circle in use as some kind of playground playtime plaything? It seemed a suitable location for the telling of stories, or the eating of lunch or snacks. Perhaps this was simply the coarse foundation for a more elaborate piece of playground furniture although we could not establish how this could have been so. Our investigation concluded, we wandered away from the circle, climbed back over the gate, and walked further northwards past some pleasant allotments. As we pondered the opaque meaning of this urban prehistorical experience, we passed a building being renovated; upon its wall was a colourful mural, depicting giant bananas and an anthropomorphic egg and spoon. And where are they now? And what would they say to us? Sources: I was told about this urban prehistory enigma by Peter Connolly, who stumbled upon the circle while out walking – my thanks to him for the tip-off. I was accompanied on this field visit by Helen Green. The lyrics at the end and the start of this post come from (obviously) Spinal Tap’s Stonehenge. Information about the school closure and fire, as well as the fire image, came from the BBC. 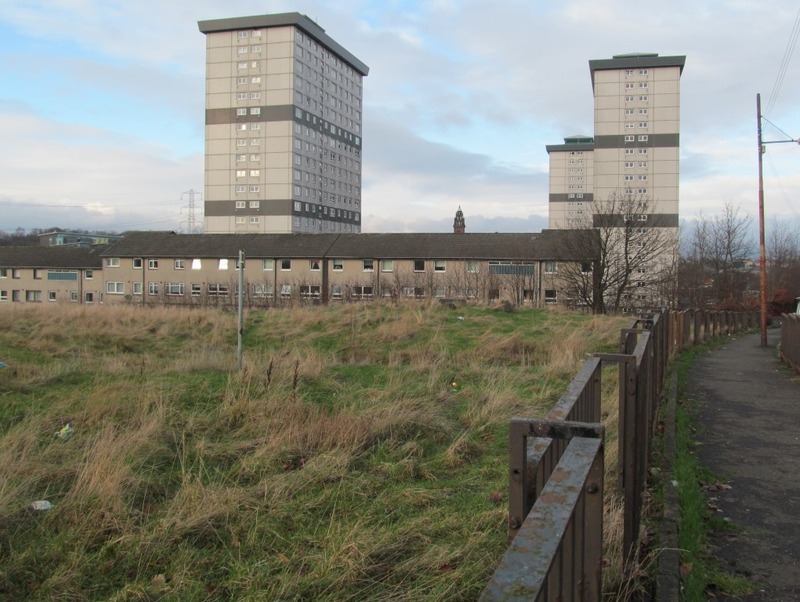 For more information on the landscape and heritage around the old school site, see the Friends of Possilpark Greenspace webpage. I hope they were put there fur the weans, or what would the point of them have been?